The trolls in my story have a very thick and nigh impenetrable skin. In the time before guns, you would need a very sharp high-grade steel blade to breach the skin and, even then, after a few hits, the blade would be dulled significantly. I did some research and the breaking point of a claymore is 2624 newtons. A 9mm bullet weighs 7.45 grams and will travel roughly at 310 meters per second. Then 0.00745 kg * 310m/s gives us an impact force of 358 ish newtons. A baseball hitter can hit hit a baseball with much greater forces than the breaking point of a claymore. So let's put a guess at penetration at roughly 2200 newtons needed with a sharp edge. So a sword seems a lot more effective than a 9mm gunshot. Would a skin that can withstand ordinary sword slash and jab attacks from a skilled swordsman be able to resist bullets from modern day firearms? My basic lookups seem to indicate so. If so, what caliber would be needed for penetration? Your trolls seem to be made similar to rhinoceros or elephant skin. Normal ordinance (like small caliber ammo) have usually poor penetration against these (they can cause bleeding but won't penetrate), but there is ammo designed specifically to hunt big pieces that will penetrate the skin and usually with terrible effects (as the skin is so thick, the bullets tend to tumble and/or break, causing horrible internal wounds). 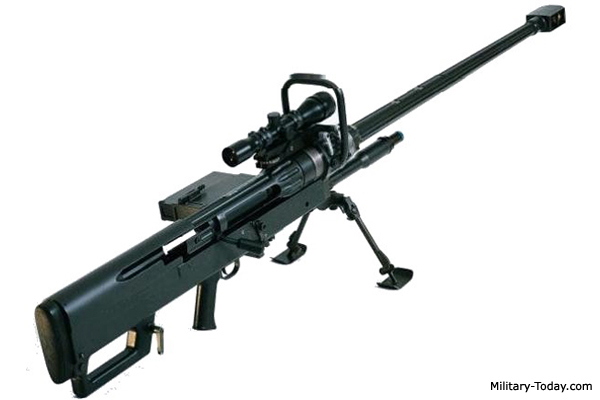 Big guns for big problems present the Denel NTW-20 antimaterial rifle. With a weight of more than 30kg it is not exactly portable but can shoot bullets up to 20mm diameter x 110mm length with a force of 40kJ at a distance of 1.8km. This is made to penetrate walls and lightly armored vehicles (that's why it's called anti-material). We guarantee no troll will withstand a well placed shot or we give your money back. 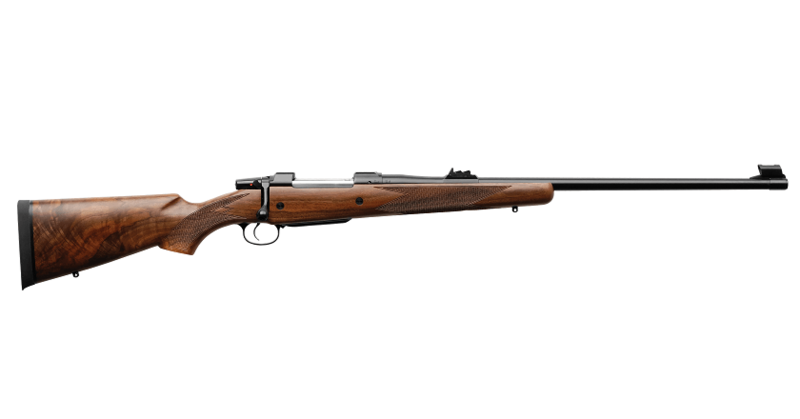 All the Game introduces the CZ-550 big game hunting gun. Chambered with a .375 magnum H&H that produces up to 6kJ of force, this gun manages to penetrate the skin of the biggest game while retaining a manageable recoil at a reasonable distance (it retains good accuracy up to 800m, although usually is shot between 300 and 500). It is also you can find in almost every major city of the planet (although not in great quantities), even in gun-regulated Europe (that frowns on anything remotely militar, but loves big bucks customers that love hunting). Buy it today and we will throw a sample of our new jacketed "no expansion" cartridge! While Stormbolter gave a concise and effective answer to your question, I'd like to add some things for you to think about. What I'm guessing from your question is humans started fighting trolls using swords. But even this method, while it manages to pierce the troll skin is: a) costly, since it dulls the sword extremely fast, b) probably dangerous. Hence, humans may or may not improve firearms technology and you're wondering if it would be effective and worth the time for them (again, this is purely a guess). I'm no military historian, but I believe cannon predate smaller firearms (Edit: by about a hundred years in Europe. We indeed saw the appeal of handheld cannon pretty quickly), simply because they're easier to conceive. Miniaturizing something is no trivial task, much so if you're still figuring how to properly contain the detonation/deflagration of the powder. From an evolutionnary point of view, humans would have first developped big cannons which would be extremely effective against pretty much anything, as long as they touch. But let's say your magical creature is somehow impervious to cannonball. Even if your munition does not pierce the troll hide, the mere resulting shock will turns its innard to pulp, and most living organisms end up pretty much dead when that happens. You would probably observe tactics such as seen in history, with artillery thinning the ennemy lines, before the infantry engage in the dirty work. Since each shot can probably kill a troll on the spot (once again, as long as it touch), humans will work to improve the technology, and eventually come to big hunting rifle. The last paragraph is of course only pertinent if trolls band up in large groups to attack humans. But defending settlement from troll attack would still be a lot easier if you can shoot the thing before it even become remotely menacing. And then, you follow the same path as explained before, and you have boomsticks to deal with trolls. Edit: Given your comment, troll as a menace that has "awoken" from the past, it boils down to what people said. Small caliber, unlikely to pierce. Special ammo, depends. Bigger guns will surely put a hole in your trolls though. Local forces may been variably equipped, but even small police department in my country have at least one shotgun or a SMG lying around. Not much to fight a full scale invasion, probably enough to repel a single troll until army get there. Sandbag penetration should be roughly equivalent to what you need. Your description of the hides, "a stone like material" and "turned to stone during the day" sounds to me like something made of "rock" just not in a solid slab (sand), held together by something flexible (bag) to allow some movement ... a Sandbag skin. It should take very little research in to the military applications of sandbags as defense to find out just how thick you want the skin to be to get the type of defense your Trolls would need or have. Not the answer you're looking for? Browse other questions tagged science-based creature-design weapons fantasy-races kinetic-weapons or ask your own question. Advantages of Ball bearing projectiles over Bullets? How do I scientifically explain a specific type of wood piercing through armor when not even bullets can?